I'm nearing the end of the alphabet for my painting class assignments. 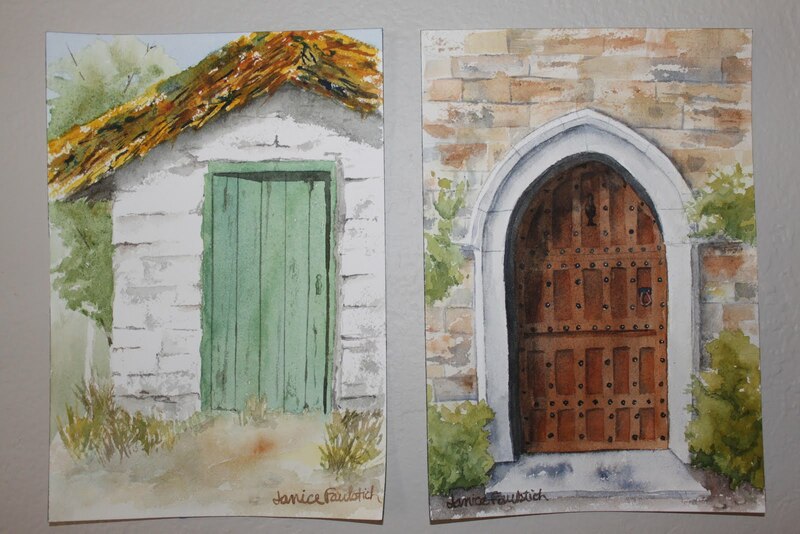 These 2 are "Killarney Barn Door" (to replace a disastrous leaf print piece the instructor wanted us to try) and "Ulster Manor House Door." Both are small-7" x 10". They were good practice, and I'm happy with the way they turned out. I only have 5 paintings to go and 10 days to get them completed-all will likely be small, as I don't have enough time to tackle anything major. You know how I love doors. 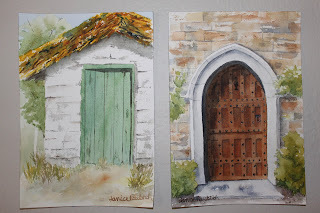 I like the faded, aged look of the green barn door, and the 3-D look of the other door and the multi color of the stones. JIm likes them too. Another job wel done! Thanks, Ann! I may do another one or two to finish the project.